Far Acres Farm and Food: Now Certified Organic! Beef, Pork, Poultry, Eggs - in the spirit of natural husbandry. 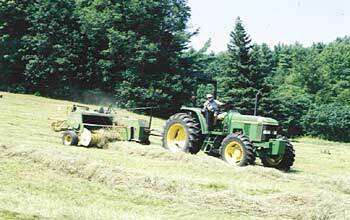 I once read an article in the John Deere publication "The Furrow" that was describing inexpensive ways to "fatten up" feed lot beef. The article described feeding time-expired "snacks", like Twinkies and cheese curls to steers being raised for beef. When the article got the to point of saying that the cattle were still gaining weight (the ultimate measure of success in agribusiness) on a diet of up to 15% time-expired chewing gum, I gave up. I could no longer eat commercial beef. On top of that I thought about vertically integrated, heavily medicated, never sees the light of day chickens. Nope, can't eat that either - meat nor eggs. How about sows that can not move except to stand and lie in the same spot while their piglets reach through bars to nurse? Then those little pigs are taken away and put in dark, smelly, crowded, barns and fed a constant low level ration of antibiotics until they are ready for slaughter. Unfortunately, I like bacon- a lot. Now, organic meats, and grass fed, pasture based meats are around and available for purchase. Yes, these meats are expensive, but they not only are healthier to eat and taste better, they are healthier for the farmers raising the animals and put less money into the large agribusinesses, which are mostly owned by chemical companies anyhow, and provide pretty lousy conditions for the automatons who call themselves farmers that work for these companies. I could afford to buy these specialty meats, but it's much more satisfying to raise them myself. My goal is to raise my animals in an environment as close to their natural habitat as possible, within the limits of my local zoning, and my ability to provide the animals with optimal nutrition. This means feeding cattle grass, poultry bugs and grass, and pigs everything. This means providing them with ample space to run and play and have species appropriate behavior - cattle have a herd and lots of wandering space, poultry has a flock, pigs have mud and places to root. Because my pasture does not provide all the necessary nutrition for my animals, I do feed them some grain, as they need it. I have chosen to use the Natures Best line of organic feeds. There are other organic feeds available, but this is the one that is most readily available in my area. In my search for the perfect breed of cattle for my yard I had several criteria: They must not be too big - if one steer was more than my freezer could hold, that's too much. They must also be decent for milking. They must be thrifty on food and hardy for our cold New England winters. So I found the Dexter breed. I won't bore you with all the details of the first pair, but I did find them, along with the American Dexter Cattle Association, which will tell you more than you ever wanted to know about Dexters. From my now several years of experience of raising them, I can say that one steer puts about 300 lbs of meat in the freezer on average. The meat is extraordinary, we've had chuck steaks as tender as fillet mignon from other beef. Even the older animals that we've had to butcher have tasted really, really good, even though they were too tough for anything except hamburger and pot roast. One of the reasons, I think, that the meat is so good, is that they are fed mostly grass, which is what cattle are supposed to eat. I do feed grain in the winter, to supplement the hay, but come summer, it's grass and more grass, except for treats a few times a week so that they remember that I am good and to be followed. That's the other thing about raising our own meat; not only do I know exactly what they have been fed, but also that they did not have a lot of stress in their lives. As of summer of 2005, I do have Dexter Beef available. Email for current stock and pricing. Here is a list of my current cattle - to see the genealogy of each one, click on the name. OK, more like pig, singular. In the Spring of 2003, I had a goal of raising 5 pigs to eat. Well, I found 4 pink piglets at a farm down the road. Then I went to a dealer for the other one, and came home with two, because this female was different from all the rest. So I raised the 4 pink pigs, one brown pig and the black and white gilt. Pigs are fun! They like to play, especially in the mud. They like to lie in their water tank. They like people, especially the ones who feed them and rub their backs. 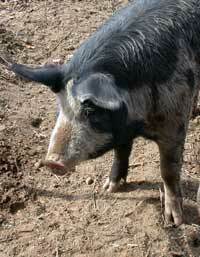 Allie the gilt became a sow on August 11, 2004 with a fine litter of 10 piglets. Some of these pigs were sold as weanlings, and some at market weight, which they reached by the end of January 2005. Another litter was born in March of 2005, all of whom are already sold, some as weanlings, some to be raised here. The pigs psing raised here are Certified Organic. I hope for another March litter in 2006. Pigs can be reserved by sending me email at any time. I then send out notification to all who have requested when I know how many pigs I have available. Chicken to eat is a good thing. But chicken from a factory can be toxic - from the food and medications they are fed, their crowded living conditions and the mechanical slaughtering which destroys the guts as they are hydraulically blasted out of the bird. Our chickens are raised in tractors, like our layers, have plenty of space per bird, and are hand cleaned to generate the most healthy and cleanest meat we can provide. We raise no more than 75 birds per season, and generally have whole, fresh or frozen chickens for sale from July through October. They are priced by the pound at $5/lb. Discounts are available to people who come help on processing days. Birds range in processed weight from 4 to 7 pounds. 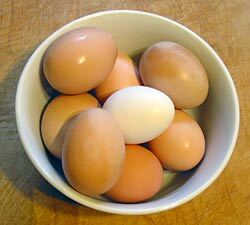 No egg has a yolk quite so yellow, and so firm and a shell so hard as one that comes from a chicken allowed to forage on grass and insects. Because we have a pet dog, Pedro, (picture of Pedro) who likes chicken for meals, and we have a vegetable garden, our lovely hens can not run loose. Instead they "run" in chicken tractors. These are portable pens with open bottoms that are moved daily to give the hens fresh grass and bugs while still protecting them from predators. 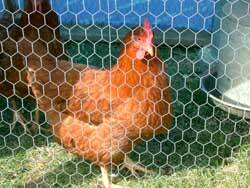 This allows the hens their natural environment and allows us to micro-manage the mowing, tilling, mulching, fertilizing capacity of the hens. For more on chicken tractors see (link to lee's Chicken Tractor website). I don't sell eggs, but if you come visit, and I have extra, I will give them away. 2004 was the first year we raised turkeys, and I have never tasted anything quite like the bird we ate. I take orders for turkeys in March and April, buy the right number of chicks, and raise them on grass and organic feed.